ARM makes 32-bit and 64-bit RISC multi-core processors. 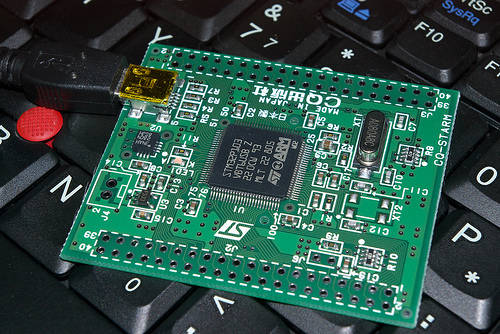 RISC processors are designed to perform a smaller number of types of computer instructions so that they can operate at a higher speed, performing more millions of instructions per second (MIPS). By stripping out unneeded instructions and optimizing pathways, RISC processors provide outstanding performance at a fraction of the power demand of CISC (complex instruction set computing) devices. ARM processors are extensively used in consumer electronic devices such as smartphones, tablets, multimedia players and other mobile devices, such as wearables. Because of their reduced instruction set, they require fewer transistors, which enables a smaller die size for the integrated circuitry (IC). The ARM processor’s smaller size, reduced complexity and lower power consumption makes them suitable for increasingly miniaturized devices. 64 and 32-bit execution states for scalable high performance. The simplified design of ARM processors enables more efficient multi-core processing and easier coding for developers. While they don't have the same raw compute throughput as the products of x86 market leader Intel, ARM processors sometimes exceed the performance of Intel processors for applications that exist on both architectures. The head-to-head competition between the vendors is increasing as ARM is finding its way into full size notebooks. Microsoft, for example, offers ARM-based versions of Surface computers. The cleaner code base of Windows RT versus x86 versions may be also partially responsible -- Windows RT is more streamlined because it doesn’t have to support a number of legacy hardwares.